What are the keys to a great piece of furniture? Sturdy construction, attractive styling, and flexibility—qualities this adaptable little coffee table has in spades. What I love most about quality furniture is its staying power. Over the course of its at times decades-long career in the home, a well-made piece can serve multiple purposes. After all, a nightstand is a nightstand only if you place it beside the bed. Choose another location for the same piece, accessorize it accordingly, and that same small table can easily perform an entirely different function. As your life and your needs change, quality furniture adapts. Since the fall, our lift-top coffee table from Sauder has been sitting in the living room, where it’s been doing those things a coffee table does best—displaying books and magazines, for example, and keeping beverages within arm’s reach. Because the tabletop lifts, the piece has also served as a casual work surface and has even functioned as an impromptu snack bar. Lately I’ve been thinking of yet more ways to take advantage of the coffee table’s versatility. That is to say, what if I didn’t actually use it as a coffee table? The same qualities that make it work so well in the living room—built-in storage and a low profile—would allow it to work equally well elsewhere at home. I love my house, but it’s not perfect. Particularly in the colder months, I’m annoyed by the lack of a coat closet in the entryway. Especially now, as the holidays bring guests, and those guests bring parkas, peacoats, and puffer jackets, I knew something had to be done to contain the approaching onslaught of winter paraphernalia. Out back, we have a mudroom that goes a long way toward keeping our kids’ stuff organized. I thought, if it works for the kids, then it can work for anyone. So I set out to re-create the mudroom’s magic in the front hall. The recipe for success involved three crucial ingredients: a place to hang coats; a spot to store miscellaneous items, such as hats and gloves; and an area for people to sit while taking off their big, bulky boots. The coffee table, of all things, ties all these requirements together. Whereas in the living room we’d used the coffee table’s cubbies to store board games and DVDs, here the same cubbies hold winter boots, lunch boxes, and a basket to catch wayward mittens. With the addition of a coat rack and umbrella bin, our winter wear solution became complete. To make the area as attractive as it is hardworking, a small graphic rug warms up the space, and cozy pillows and a throw blanket invite visitors to rest upon arrival or as they prepare to leave. All told, it took me just 15 minutes to move and restyle the coffee table, and I feel certain that, in its new location, it’s going to serve us well through the season. My kids are learning to read, and it’s wonderful to see them so excited about books. 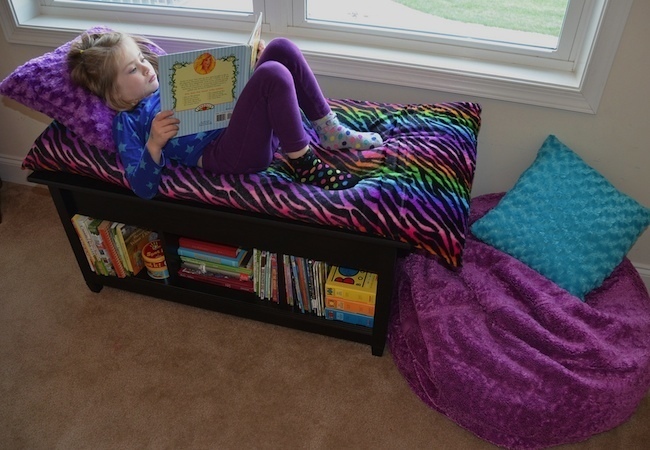 To encourage their new pastime, I’ve wanted to create a special place where they can lounge comfortably with a favorite book. A built-in window seat in the playroom would be perfect, as the exposure looks onto the garden and has a beautiful view of the sunset. We may be a year or two away from actually building that window seat, but in the meantime, I couldn’t help testing out the design concept. 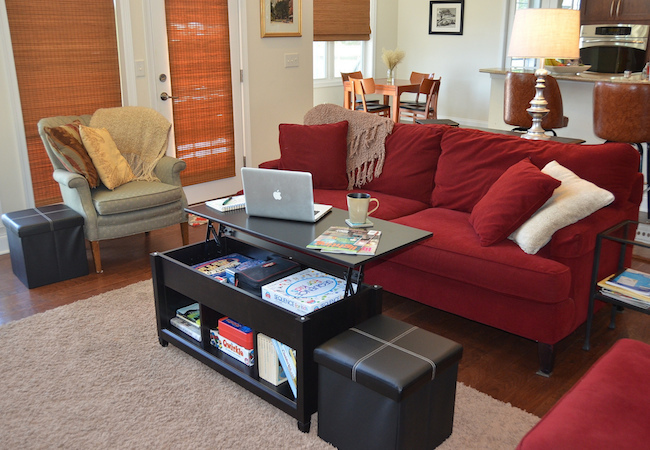 Here, the coffee table serves as both a bench and a mini library. 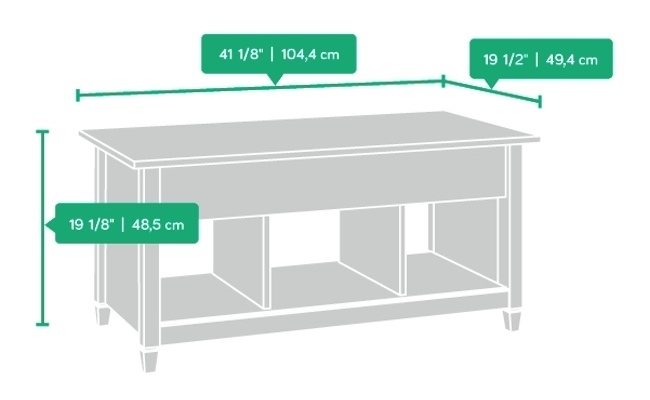 A well-made piece of solid-wood furniture, it’s sturdy enough to support the weight of a 40-pound child. And the integrated cubbies fit books of all sizes, keeping them off the floor in a room whose carpet often cannot be seen for a blanket of playthings. On top of the table, I placed a long, cushy pillow covered in a fabric that unites my girls’ love for both rainbows and animals. A couple of fuzzy throw pillows round out the look. A beanbag chair, which we already had on hand, sits next to the bench, so both girls can occupy the nook at the same time if they want. Sure enough, before long my youngest planted herself on the window seat to browse her latest find from the library. I’d hate not to have the coffee table in our living room, where it fits right into the decor and our lifestyle. But I love knowing that if the room ever evolves to the point where the table no longer belongs, I can easily use it elsewhere. That’s what I call staying power, and it’s the reason to buy quality wood furniture. This post has been brought to you by Sauder. Its facts and opinions are those of BobVila.com.